Is when we begin to lose our inner peace. And you’ll keep your peace within. Nope… nothing wrong with that at all. I think it’s what the world needs. 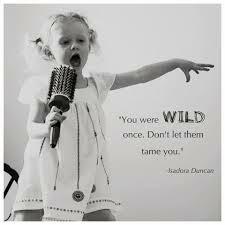 Not hurting wild, but wild enough to free ourselves. And not get all too stuck up with the norms or what other people ‘would’ say. Thank you for asking about the ride yesterday, that I conveniently skipped out on. The “big” ride is this Saturday, I’m pretty excited about it to say the least. There were up to 5000 riders who rode yesterday and it took all I had to say no to the event. When you get that many folks on bikes who normally do not ride – Its a recipe for disaster! I really don’t want to dry up. I did… sometime back… wilted my growing vines. =/ I felt like a zombie, like some sort of body aimlessly walking around. Things were done out of rote and much later on, you feel something amiss. And you realize you have been missing yourself. To find a focal point where you can divert your energy and passion… I’m very, very grateful I explored yoga even with much blah-blah-blahs from other people… at least now, I found my centre. Oh I fiddled and twiddled with my thumbs. Constantly trying out varied stuff to ignite the spark within. Though at first, I wasn’t certain why I kept searching, not even knowing what I was searching for. I ran. I pedalled. I studied. I swam. I danced. And only to realize after so many damn years, I was only searching for myself. Yoga made me realize that. The search is ongoing but I found the path. As we all need to do, we cultivate our own path. The power yoga studio I attend is brilliant, the energy, flow, balance is second only to yours! The only real adjustment I need is when I enter the studio, focus my mind and set my intention(s), to heal and nurture my body – without knocking anyone over when I tumble over! Not into intricate details but detailed enough for me to understand what you went through, your reactions toward the incident, and your healing period. And what the heck is a guest post??! You got me curious!! Don’t you find this dangerous you’re tossing me the keys? ?